The VPN needs to be encrypted, and you want it to be strong. Not all VPNs are the same, so do your homework. What is an encrypted VPN? An encrypted VPN is technology that essentially creates a tunnel between two devices (typically the server and the client). The data is encrypted entering the tunnel and decrypted as it exits it. 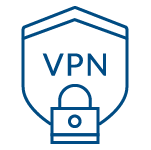 There are a couple of standard encryption protocols for VPNs other than SSL, IPsec (Internet Protocol Security) and GRE (generic routing encapsulation). GRE gives you a framework with which you’re able to package and transport via IP. You need secure sockets layer (SSL) certificates established throughout your site, for any domains and subdomains on which sensitive information is accessed. In other words, any parts of your site that need login credentials should always also have an SSL. Each server used for your site needs its own SSL certificate installed. Note that some companies provide certificates that can be installed on multiple or unlimited servers. Also, be aware that an EV certificate, creating a green address bar, and/or respected brand name such as Norton or GeoTrust, can help increase trust and credibility for your system. Less costly certificates can be purchased from Comodo, GoDaddy, etc. 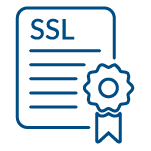 An SSL (secure sockets layer) certificate is software that creates encryption of data during transmission and validates ownership of the certificate to varying degrees. Groups called certification authorities (CA’s), which typically have very high reputations for security, issue these certificates. SSL certificates come in three main levels of validation: domain validation (DV), organization validation (OV), and extended validation (EV). All certs create https protocol and a lock icon, along with brief information available to all web users. EV is represented by the green address bar indicators in all major browsers. SAN certificates and wildcards certs are other types.